Note: The Twist by Chubby Checker was a #1 Hit in 1960, but reached #1 (again!) in 1962 created an entirely new experience in Popular Culture. Instead of including it here, we have an entire page dedicated to the song and Chubby Checker. Surf guitar instrumental, originally a soft big band tune by Harry James. Twist and Shout was written by Phil Medley and Bert Berns (later credited as “Bert Russell”) in 1961. They were also the first to have a hit with Shout, in 1959. This was one of Motown Records’ earliest hits, and the biggest hit for the group. From the film ‘Blue Hawaii’ this is Elvis’ most well known Love Song. First a hit for Jo Stafford in 1952, this has become the most remembered version of the song, and the biggest hit for the group. Eva Narcissus Boyd (June 29, 1943 – April 10, 2003). The song was # 1 for Little Eva in 1962, #1 for Grand Funk in 1974 and # 3 for Kylie Minogue in 1988. Ezekiel Christopher Montanez was born on January 17, 1943. Was he popular? Well, The Beatles opened for him (and Tommy Roe) in 1962. This peaked #2 for Chubby Checker, just another Chubby line dance song in the scheme of things. Everybody else was doing their own version of The Twist in 1962. INspired by a line from the film ‘Tennessee’s Partner’ and written by Bob Crewe and Bob Gaudio. Claudine Clark was born on April 26, 1941 in Macon, Georgia. Twistin’ the Night Away was written by Sam Cooke, and one of the longest-lasting “Twist’ response songs. Philly’s biggest ‘girl group’ of the 1960s, included Rosetta Hightower, Shirley Brickley, Marlena Davis and Stephen Caldwell. Gene Chandler was born Eugene Dixon on July 6, 1937, and he wrote ‘Duke of Earl’. Sedaka wrote the music and performed the song, and the lyrics were written by Howard Greenfield, who also wrote many other hits and even TV theme songs. Written by Brian Wilson and Mike Love, from the album of the same name. FLIP-SIDE was ‘409’. This was their first Top 20 Hit. Written by Aaron Schroeder and Wally Gold. His last name is pronounced “sh-NELL” and he was born Bruce McMeans on November 28, 1940. Delbert McClinton played harmica on the track. DJ Ötzi did an updated version in 2000. Ernest Peter “Ernie’ Maresca (August 21, 1938 – July 8, 2015) was primarily a songwriter and record executive. The ‘Big O’ Roy Kelton Orbison (April 23, 1936 – December 6, 1988) had an incredible vocal range, and that’s why he wrote most of his own songs. But not this one. Cindy Walker, a songwriter, country music singer, and dancer, wrote it. David led an orchestra for years, and wrote many tunes and TV themes. This was his biggest hit, and, in case anyone asks, he was also Judy Garland’s first husband. It was his second marriage – previously he was married to the actress Martha Raye. ‘Desafinado’ is a Portuguese word (meaning ‘Out of Tune’ or ‘Off Key’). One of the Top 5 most well known instrumental jazz songs of all time. Written by Bobby Sharp (1924-2013) Sharp sold the song to Teddy Powell for $50. There was some wrangling over the deal for 20-odd years, and Teddy ended up with 1/2 of the songwriting credit. Gene Francis Alan Pitney (17 February 1940 – 5 April 2006) The song comes from the film of the same name. Booker T. Jones, born on November 12, 1944, wrote Green Onions at age 17. “MG”officially stood for ‘Memphis Group’ – they were from Memphis and were Stax Records’ house band. Officially they are the Four Seasons Partnership, owned by Bob Gaudio and Frankie Valli 50/50. Since in 1969 they have been called Frankie Valli and the Four Seasons. Sam went to the same High School in Chicago that Nat King Cole graduated from – Wendell Phillips Academy High School. Written by country legend Don Gibson, this was Ray’s last #1 Hit, and was included on his Modern Sounds in Country and Western Music album. #1 for the girls – Addie “Micki” Harris, Shirley Owens, Beverly Lee, and Doris Coley. In 1963, it was discovered that the record label and their manger DID NOT have the trust fund with their earnings promised after they became age 21. #1 in 1962, and re-arranged and recorded in 1975 to reach #8 on the charts. The Cookies did background vocals. This was the only version of The Twist that came close in popularity to the original in 1962. It was actually in two parts, with Part 2 pretty much being an instrumental extension of the song. Dion Francis DiMucci (born July 18, 1939) This was written by Dion DiMucci himself and Ernie Maresca. This was the first Hot 100 song by the band. It sounds a lot like… an early Beach Boys song. The Doo Wop Duo were Roland “Don” Trone and Claude “Juan” Johnson. Marcie Blane was born Marcia Blank on May 21, 1944 in Brooklyn, New York. Michele Ann Marie ‘Shelley’ Fabares was born on January 19, 1944, and was probably better known as a television actress. Or three films with Elvis Presley. Released in late 1961, Baby It’s You was written by Burt Bacharach, Luther Dixon and Mack David. This was the B-SIDE of the single with ‘Having a Party’ and actually got more play in 1962 than the A-SIDE. Little Joseph Hall was from Philadelphia, and The Flips were from Upper Darby, a Philly suburb. Upper Darby is also known for being the home to singer/songwriters Todd Rundgren and Jim Croce. Written by TV show producer and ‘Gong Show’ host Chuck Barris, the song is a tribute to New Jersey’s Palisades Amusement Park. Written by Pete Seeger in 1955, with some additional lyrics added by Joe Hickerson in 1960, it was one of the first political ‘hippie’ songs, although it was released several years before any counterculture or youth movement in the United States. Anthony Dominick ‘Tony’ Benedetto was born on August 3, 1926, and this is his Signature Song. Hiring Nelson Riddle was cheaper. Route 66 (US 66) traversed from Chicago, Illinois, to Los Angeles, California from 1926 through 1985. People probably just stole too many street signs. I think my uncle had one. Smokey Robinson wrote most of her hits, and she never regained the success she had with the label when she left Motown in 1964. I Sold My Heart to the Junkman’ is a 1946 song originally recorded by The Basin Street Boys featuring Ormonde Wilson, written by Leon René. In 1962 it put Patti Labelle on the Pop Music Map. The ‘Blue-Belles’ were actually ‘The Starlets’. In the early days of telephones, the first two digits were the exchanges through which the call would go. Beechwood = BE (the letters on the phone) or 234-5789. The song was a tribute to the Telstar Satellite, and the band was from England, not be confused with the California surf band who had a near-hit with ‘Bustin’ Surfboards’ the same year. The English Tornadoes did have another track called ‘Jungle Fever” that is worth a listen. Also, these guys were the first English band to reach #1 in the USA. Originally written in 1927 by Al Jolson, Billy Rose, and Dave Dreyer. Actually, Al Jolson did not write it or co-write the song. As the biggest star in the world (late 1920s), he often wanted writer credit if he’d sing it, to increase his share of the residual profit. Bernard Stanley “Acker” Bilk ( January 28, 1929 – November 2, 2014) If you were wondering in a clarinet-based song from an English television show called ‘Jenny’ could be a #1 Hit in America in 1962, the answer is yes. Thomas David ‘Tommy’ Roe was born on May 9, 1942. Tommy reached #1 with Shiela, and in 1969 with ‘Dizzy’. Few people had a number one song BEFORE The Beatles, than AFTER the Beatles. Tommy Roe did. Concetta Rosa Maria Franconero was born on December 12, 1938. This was Connie’s last #1 Hit, and she had moderate success through the 1960s, including starring in several movies. ‘Papa-Oom-Mow-Mow’ was a Top 50 Hit, but the followup ‘Mama-Oom-Mow-Mow’ didn’t fare as well. In 1963, The Trashmen reworked it into ‘Surfin Bird’ into a Top 5 Hit. Everybody knows – The Bird is the word. Kenneth Daniel ‘Kenny’ Ball (May 22, 1930 – March 7, 2013) Kenny Played the trumpet. Vasily Solovyov-Sedoi and Mikhail Matusovsky wrote the song in Russia in 1955. 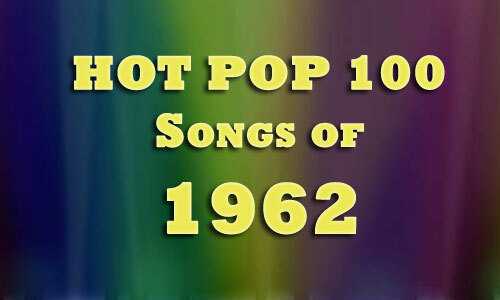 Connie’s last Top Ten Hit, played constantly in the Summer of ’62, when a Twist Song wasn’t playing. She does mention the ‘Mashed Potato’ – another dance (and song) of 1962. Another #1 Hit from album ‘Modern Sounds In Country And Western Music’. Also written by Cindy Walker, who also wrote Roy Orbison’s Dream Baby (How Long Must I Dream). In addition to the huge hit ‘Peppermint Twist’ Joey Dee and the boys also reached #6 with The Isley Brother’s ‘Shout’. …and he starred in the 1962 film ‘Hey, Let’s Twist!’. John D. Loudermilk wrote all five of Sue’s biggest hits – Sad Movies Make Me Cry, Norman, Paper Tiger, Have A Good Time, and James (Hold The Ladder Steady). Roses are Red was written by Al Byron and Paul Evans. Stanley Robert Bobby Vinton, Jr. was born on April 16, 1935, and this was the first of four #1 Hits for the ‘The Polish Prince of Poch’. Barbara George was born Barbara Ann Smith (August 16, 1942 – August 10, 2006). Barbara wrote most of her own music, including this. A post-50’s style band that carried on through several personnel changes through the 1960s. “And when I told her I didn’t lover her anymore… she cried.” COLD. Barbara Alston, Mary Thomas, Dolores “Dee Dee” Kenniebrew, Myrna Giraud and Patricia “Patsy” Wright formed The Crystals in 1961. Phil Spector added Darlene Love, without the original Crystals for this track. Then the originals started recording, then they didn’t when Phil started giving all his attention to The Ronettes. Confused? Then you understand what happened as well as we do. Won a Grammy for ‘Song of the Year’ for Sammy. Ricky changed his name to ‘Rick’ in 1961. The song was written by Jerry Fuller, who wrote 23 songs for Rick (and Ricky). The Mashed Potato was a dance before the song came out, but this became Dee Dee’s (Dione LaRue) Signature Song. The ‘409’ referenced is the Chevrolet 409. This was the FLIP-SIDE of the 45 RPM Single. Jukeboxes often made both sides playable, which could make both sides ‘hits’. Chains was written by the husband and wife songwriting team Gerry Goffin and Carole King. We could say that about a lot of hits from the early (and even late) 1960s. The Cookies actually started as a group in 1953, and had several personnel changes. Written by Buddy Kaye, Ethel Lee and David Hess, and referenced the Warner Brothers cartoon character. Robin Ward did the female vocal and Mel Blanc was the voice of Speedy. The girls started out as Audrey and the Teenettes in the late 50s, but since Audrey was only 13, her mother didn’t allow her to perform in nightclubs. There were personal changes and The Orlons were born. Claude King (February 5, 1923 – March 7, 2013) Wolverton Mountain is in Arkansas. Written by Jimmie Davis and Charles Mitchell in 1939, and Ray’s version is the most popular. Through the 1960s, members included Gladys Horton, Katherine Anderson, Georgeanna Tillman (deceased), Wanda Rogers, Ann Bogan, Juanita Cowart and Georgia Dobbins. Dee Dee Sharp was born Dione LaRue on September 9, 1945. She was 17 in 1962 when she had 4 Top 10 Hits, including her upbeat duet with the PopStar of the Year, Chubby Checker. Q: Who was the most influential an underrated R&B performers of the 1950s and 1960s? Released in late 1961, this was the first Top 20 Hit for the girls, who included Barbara Allbut, Phyllis Allbut, Peggy Santiglia, Bernadette Carroll, Lynda Malzone, Linda Jansen (Jankowski), Toni Mason and Debra Swisher. There was a lot of turnover for the early girl groups. This was the biggest hit for Esther Mae Jones (December 23, 1935 – August 7, 1984). At 14, she won an amateur singing contest at the Barrelhouse Club owned by Johnny Otis. Johnny added her to his touring show, and she recorded and toured until shortly before her death. Englebert Humperdink ( real name: Arnold George Dorsey) also scored a Top Ten Hit with ‘Release Me’. Bubblegum Pop started in the mid-1960s. Brian Hyland (born November 12, 1943) could be considered the ‘Grandfather of Bubblegum Pop’ like Neil Young is the Grandfather of Grunge. Peter Yarrow, Paul Stookey and Mary Travers sang it and Pete Seeger and Lee Hays wrote ‘If I Had a Hammer (The Hammer Song)’ in 1949. Written by brothers Noel Sherman and Joe Sherman, there were two other songs named ‘Ramblin’ Rose’ written in the past hundred years, but Nat’s is the most well known. Gary U.S. Bonds (born Gary Levone Anderson on June 6, 1939 in Jacksonville, Florida) took advantage of the ‘Twist Frenzy of 1962’. Kal Mann wrote this and several other Twist Songs for Chubby and Dee Dee. Dave “Baby” Cortez (born August 13, 1938, Detroit, Michigan) The riff sounds much like “Love Is Strange” by Mickey & Sylvia, with just a touch of ‘Stay’ by Maurice Williams and The Zodiacs. Herbert ‘Herb’ Alpert (born March 31, 1935) is also the ‘A’ in ‘A&M Records’. Sander L. ‘Sandy’ Nelson (born December 1, 1938) is probably the most famous Pop/Rock drummer of all time, next to Ringo Starr. He was also a session/guest drummer for many 60s artists. The original group consisted of Fred Milano, Angelo D’Aleo, and Carlo Mastrangelo. They took their name from Belmont Avenue, the Bronx, NYC. After Dion left, the group carried on without him. Royden Dickey Lipscomb (born September 21, 1936) started his career in the late 1950s. An early Teen-Age Death Song, he promises to join his girl who committed suicide in ‘the dirty old river’. Jimmy Ray Dean (August 10, 1928 – June 13, 2010) The Country/Pop Star also did some acting and even guest-hosted The Tonight Show for Johnny Carson. David Walker was born May 5, 1941, and went by Bunker Hill. This song was recorded with a ‘live’ party R&B sound. George Richard Chamberlain (born March 31, 1934) started as a stage actor and singer, moved up to TV, and even sang the theme for his show, Dr. Kildare. Cotton Fields was Huddie Ledbetter, better known as Lead Belly in 1940. Willie Nelson, Waylon Jennings, Johnny Cash, and Kris Kristofferson also formed a ‘Country Supergroup’ with the same name and they had to license the name. ‘Lemon Tree’ is a folk song written by Will Holt in the late 1950s. John ‘Ace’ Cannon was born May 5, 1934 in Grenada, Mississippi. Honky Tonk piano, guitar picking and saxophone instrumental. They write or perform songs like this any more. Ray is best known for 1974’s ‘The Streak’. John Lawrence Finneran (October 10, 1938 – July 22, 1973) Larry had a Beatlemania near-hit with ‘The Other Ringo’ in 1964. They broke up in the late 1950s, Yvonne Mills Baker, Sam Armstrong, Richard Curtain and Alphonso Howell regrouped in 1961. This song is due for a remake, I think.